Melodrama. 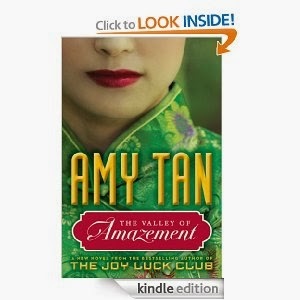 That’s how I view Amy Tan’s new novel The Valley of Amazement: 600 repetitive pages of melodrama! Too long, too repetitive, very disappointing. I struggled through The Valley of Amazement, but I didn’t enjoy it. Set in Shanghai between 1900 and the late 1930s, the novel centers on two courtesans, mother and daughter. The first several hundred pages are narrated by the daughter, who is unaware of much of her own history. Nearly at the end, the mother’s first-person account of her own story back-fills the tale. Both stories include lots of melodrama (tender husbands dead; children snatched away; many sorts of exploitation and mistreatment; riches-to-rags-to-riches plotlines). The choice of telling the story in reverse order seems awkward rather than suspenseful. In addition, both women’s stories provide lurid descriptions of the life of a girl sold or otherwise forced into slavery. Yes, though each one lived in luxury, she was effectively a slave, and her life depended on learning to curb her own wishes and to please the men who bought her high-class favors. As a literary choice the subject of a Shanghai courtesan 100 years ago could go in a number of directions, but I think this one didn’t turn out well. Sorry, Amy Tan, I’ve loved almost all of your other novels. This one didn’t come up to any of the previous ones I’ve read. I see the amazon.com reviews are coming in to agree with me. Note: I posted this review on amazon.com, just for fun. I usually don't bother to be one of hundreds of amazon reviewers.